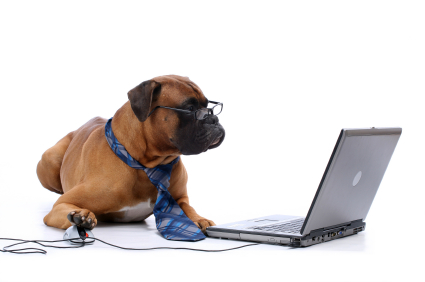 Home Tips & Advice Why You Should Take Your Dog To Work ? Why You Should Take Your Dog To Work ? Large scale employers, and even smaller companies, are always looking for ways to increase employee productivity (and thus their profits). Many companies have begun to offer new and surprising perks to their employees in hopes of achieving this goal. One of these perks is allowing employees to bring their dogs to work. While your first reaction may be to think that dogs will be a distraction in the work place, the results of several studies suggest the opposite. In this article you will learn the benefits of having dogs in the work place and receive some tips for convincing your boss to let you bring your own dog to work. A recent survey found that employees reported lower levels of stress when their pets accompanied them to the workplace. Research also shows there are other positive effects pets can have, including cardiovascular health, autonomic stress responses and blood pressure. Studies show the value of taking frequent, short breaks as a way of increasing your productivity and having your furry friend in the office with you guarantees that. Your furry friend can put you in a great mood which can lead to better moods with your colleagues, co-workers and customers. Stimulates creativity: A company that allows pets in the work place has already established itself as an outside-the-box thinker, which encourages employees to think outside the box as well. Having a dog in the office facilitates short breaks from work which give the brain a chance to rest and recharge. Even outside of the workplace, studies have shown that individuals who interact with pets have a lower risk for depression and higher serotonin levels. Increased productivity: Most 9-to-5 jobs require employees to spend a large portion of their day sitting at a desk which can be both physically and mentally draining. Studies have shown that taking short breaks from work on a regular basis throughout the day can help to improve both accuracy and productivity in work. Dogs provide natural opportunities for these short breaks, helping to improve both productivity and morale in the work place. Improved attendance: Several studies have shown that having a pet around reduces stress levels, which in turn, bolsters your immunity. This means that you will be sick less often. This is good news for your employer because it means fewer sick days for employees. Bonding: Camaraderie and trust in the work place is essential for a thriving business, especially if your employees have to work in teams. Allowing dogs at work gives employees something to gather around and it facilitates friendly conversation. In general, having dogs around can encourage a more positive vibe which will reap positive effects across the board. Suggest a trial run – your boss is more likely to give something a short-term chance to gauge its success then to just sign off on a new policy without trying it out.